"The most rewarding part of this initiative was seeing the positive reactions, excitement and interest we managed to spark in numerous young people." We know that providing children with ‘hands-on’ experiences works really well in promoting their interest in Electronics. There is nothing like the sense of satisfaction when you complete a project and it works! For most of us, it’s where our fascination in Electronics comes from. That is why we, at the UKESF, place a great focus on getting our undergraduate scholars to help us inspire the next generation. In this blog post, three scholars from the University of Edinburgh share their experiences about creating a project and taking it to schools. It is a fantastic example, from three inspirational students, of how the UKESF can make a real difference. Like all good ideas, this one started as a discussion between three friends at a pub in September last year. We had all worked with various outreach events before, mainly holding talks and showcasing some personal electronics projects and felt we wanted to do something more this year. Running a workshop with actual hands-on electronics quickly surfaced as an idea and was something we were all enthused to do. Building a custom-designed project seemed like the best way to make sure we were passionate about what we were doing and could easily convey that excitement to the students. Now it was a matter of coming up with what kind of workshop we wanted to run and what goals we wanted to achieve. Our conclusion was that we wanted to show how easy it is to start electronics with cheap and readily available materials, make sure the kit build was fun and not too heavy on theory and finally make it something interactive through either the visual or auditory sense. 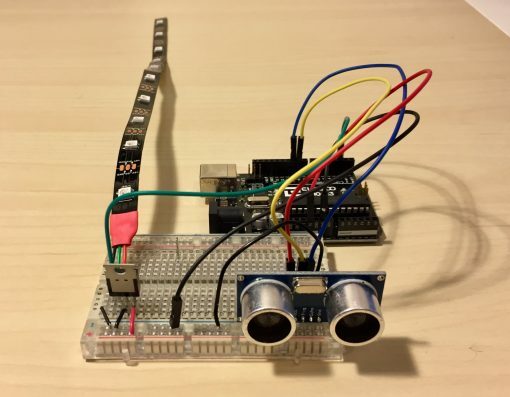 The end result: an Arduino-based distance measurement tool using an ultrasonic sensor and an RGB Led strip indicator. The kit would thus showcase one of the most popular microcontrollers for beginners, the Arduino, use basic physics to calculate and measure distance using sound waves, and allow for cool visual feedback of the measured distance through the Led strip, the colour of which is customisable by the students for added bonus. Read the news story about the schools the scholars visited HERE. Ben and Kasper also travelled to India to run the workshop with students at the Familia organisation near Kolkata – read about their trip HERE.